The first time Mike Norris met Minnie Adkins, he didn’t have much to give her. So he gave her some music. Specifically, he gave her a CD by his group, the Raggedy Robin String Band. She found herself drawn to a song called Bright Blue Rooster. At the time, Norris was director of communications for Centre College in Danville and moonlighting as a folk musician. Adkins already was a nationally acclaimed folk artist, known for her wood carvings of animals. In fact, that first meeting was a 1992 event where Adkins was honored by Centre. She got an award and something of a muse in Norris’ music. Soon, he was receiving characters from the song, whittled from wood by Adkins. And they did, releasing the children’s book Bright Blue Rooster (Down on the Farm) in 1997. Sonny the Monkey, which Norris wrote 10 years ago over a Christmas break, tells the story of the title character’s hapless quest for a banana, including being tricked by a fox and saved by a mouse. For the story, Adkins, 78, went about carving the characters, including a human couple named Minnie and Herman, after Adkins and her second husband, Herman Peters. Norris and Adkins worked on the book off and on for several years. In March at Kentucky Crafted: The Market, Norris met Doug Sikes, publisher of Acclaim Press in Morley, Mo. Sikes was interested in the idea of books with three-dimensional art like the photos of Adkins’ work. The pair had a venue for a new book in Acclaim’s Joey Books imprint and for publishing a new edition of Bright Blue Rooster. The first book brings back good memories for Adkins and Norris, who enjoyed touring schools together, reading and sharing their art. Norris says, “Minnie would always do it great because I’d be telling them something about the book, and she’d interrupt me. I’d act like I didn’t want to be interrupted. The pair always asked for the name of a child who could use “a bit of a boost,” Norris says. The school appearances also were a boost for Adkins, whose first husband and longtime collaborator, Garland Adkins, died in 1997. 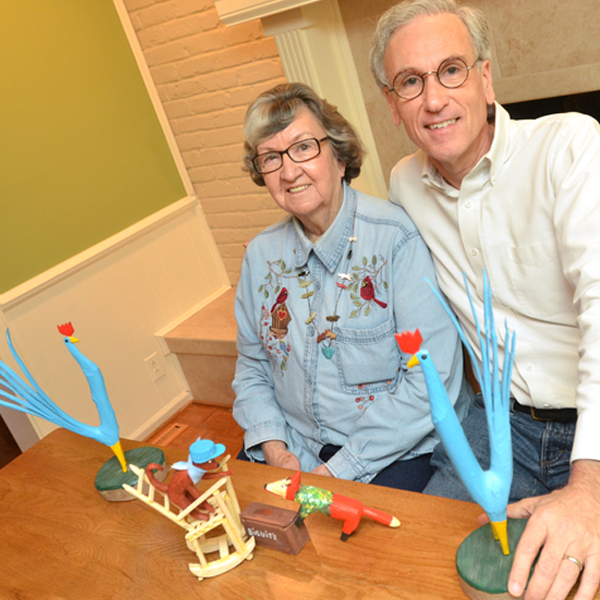 Second husband Peters, a retired pipe fitter, works with Adkins on steel versions of her signature critters. Norris says the original book did well in schools, illustrated with a combination of Adkins’ drawings and photos of her carvings. But when Acclaim got involved in the reprint, they wanted all the pages to have three-dimensional art, so Adkins went to work on characters for Sonny the Monkey and characters such as the Kudzu Man who had been drawn in the original Rooster. The duo hope that the new book and new Rooster, which will be released in January, will meet success similar to their first effort. They don’t plan to wait 16 years for the next follow-up. Norris says, “That’s seven total, including these books.” He adds that Mommy Goose is an Appalachian version of Mother Goose. “I can just see Minnie’s carvings for these,” he says, reciting a rhyme about raccoons that take over a house. Adkins says she is most productive when the weather is bad and she has to stay inside. She says she dreads winter. But if you like the Bright Blue Rooster and Sonny the Monkey, you might want to wish for snow this year. Rich Copley: (859) 231-3217. Twitter: @copiousnotes. Blog: copiousnotes.bloginky.com.